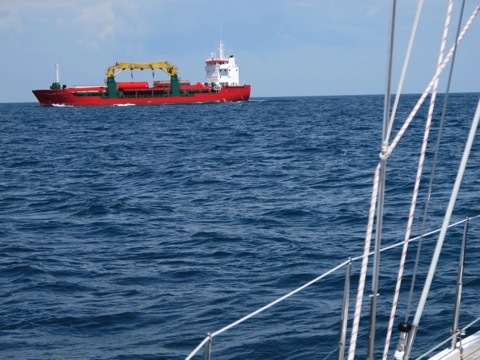 3 years ago when we first got an AIS receiver we were SO happy that we could easily see and understand ships. 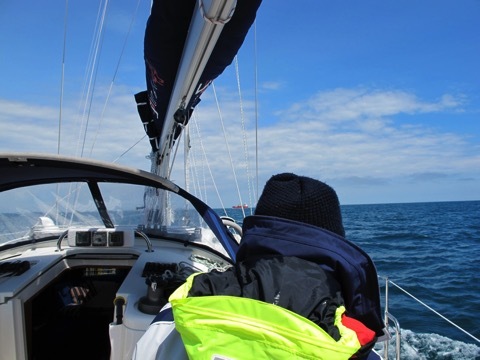 The AIS receiver allowed us to see all ships within a 15-35 mile range AND to know their name and call sign so we could call them if we saw they would come close to us. 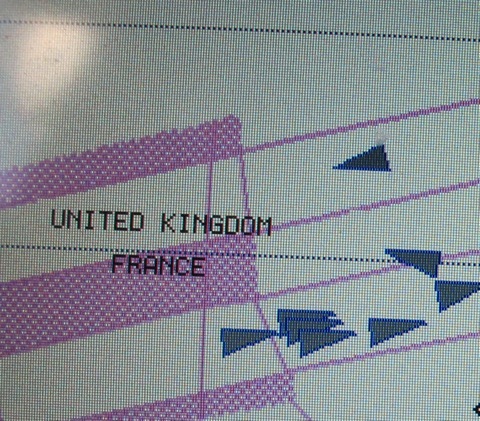 Here is a typical view of the plotter showing ships as small triangles. 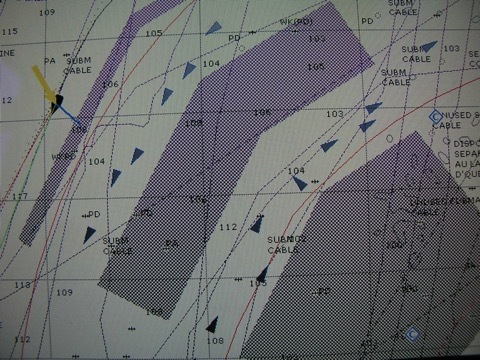 We are in the upper left corner with the yellow arrow indicating the wind, blue is line showing a small current/leeway. 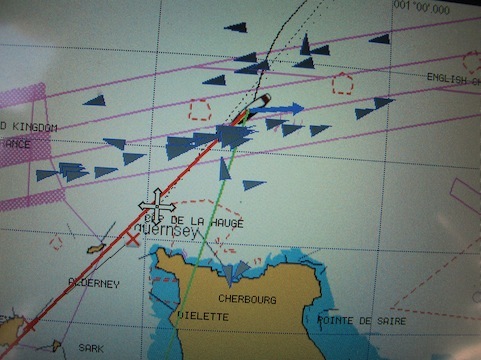 The greyed lines are showing the shipping traffic separation scheme near France. 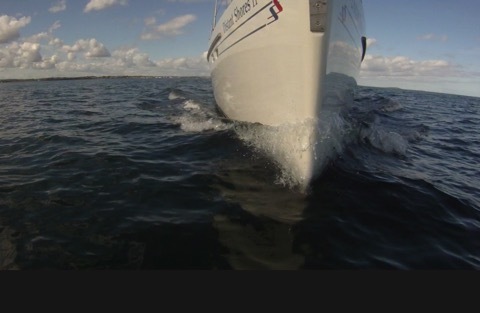 With the AIS you can see the exact position of the shipping and instantly understand what they are doing. For instance, the ship in the top center of the screen appears to be heading for us. But he is obviously in the lanes so we know he will turn shortly and will not be a concern. And If he was we could just look at him for more information. AIS shows all kind of info including length, speed, name callsign etc. Here is a sample screen. Note we even see the ship’s length, beam and draft. The CPA is “Closest point of Approach” and the TCPA is the time until we will reach that close point. 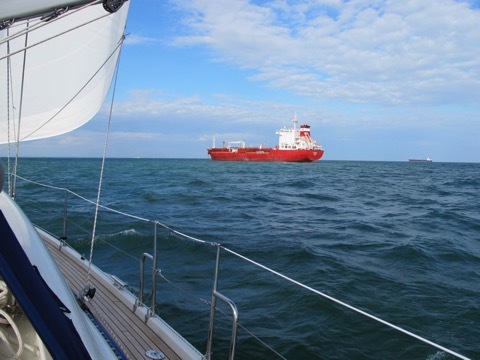 In this case the ship is heading away from us so there are no number for CPA and TCPA. 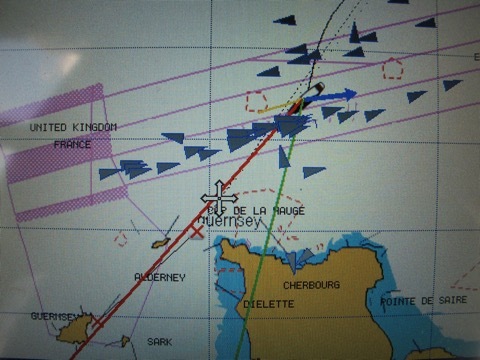 Keeping an eye on approaching ships as we cross the english channel to Guernsey in the Channel Islands. Should we alter course? Is there a risk here? No, this ship is anchored and we knew this miles in advance since the AIS showed their speed as 0.1 knot and the status as anchored! So what could be better than having an AIS receiver?? How about an AIS transmitter like the big ships have! That way ships can see us as well. They will get automatic alarms if we are going to come close to them. Although they should see us on their radar, this is a much more secure system and works without needing an operator. In conditions of reduced visibility they will know exactly where we are as well as our speed, name and callsign. This is called AIS Class B. 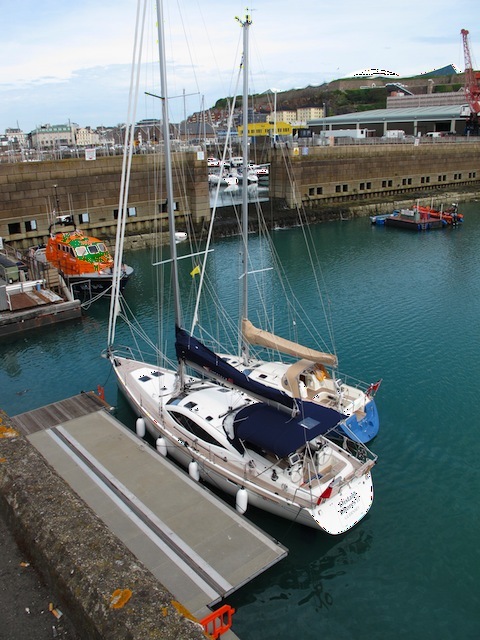 With Distant Shores II we have added one of the new Raymarine AIS transmitters. 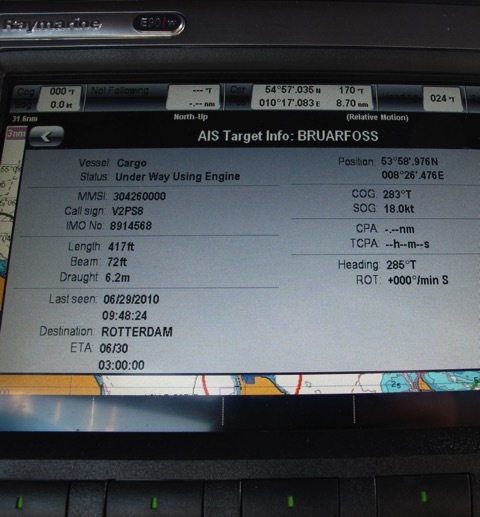 The newly designed AIS Class B Raymarine AIS500. 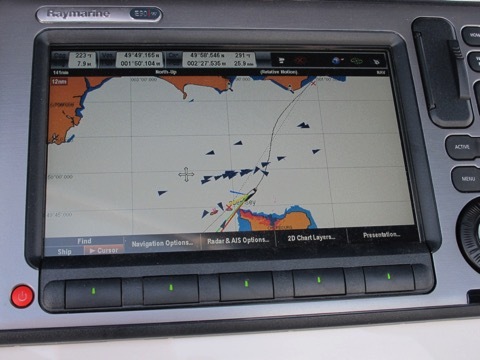 This is a very cleverly designed system and integrates amazingly into the Raymarine network. It uses the ships existing VHF antenna so it doesn’t need almost any additional wiring. And since it displays the shipping on the plotter it doesn’t need a separate monitor either. The AIS500 is just a small box that is hidden away, using very little power. Now that we have had a couple of passages with the system I can report back that it is fantastic!! Crossing the English Channel to the Channel Islands I took this screenshot as we were crossing the shipping lanes near Guernsey. Busy! Similar as we were crossing the North Sea up to the Netherlands. Now the ships see us as a target on their systems and are instantly alerted if we will come close. In practice we have found them to be happily swerving a bit to avoid us without us needing to call them in advance. Of course we also change course to avoid the ships, but now we are broadcasting AIS they will immediately see we have altered course and realize they don’t need to. 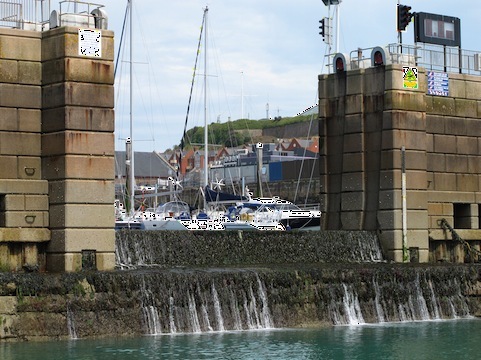 I cannot stress enough how the AIS system has reduced our worries on sea passages. Especially at night it can be difficult to deal with shipping. In the event there are many ships it used to be almost impossible to call the ship you were worried about since you didn’t know their name. Now with AIS you call the exact ship you are concerned about. And now our with AIS Class B transmitter they will know who it is so they could call us as well. 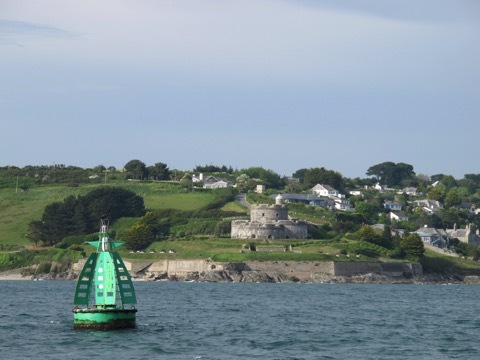 Since AIS uses very little power and is not very expensive it seems like a very intelligent purchase for sailors who venture out to sea as we do. It is the best kind of insurance - the kind that reduces the risk of a problem in the first place!